"Rishikesh" is a name of lord Vishnu that means 'lord of the senses'. Rishikesh is a holy city for Hindus located in the foothills of the Himalaya in northern India. The place gets its name after Lord Vishnu who appeared to 'Raibhya Rishi', as a result of his tapasya (austerities), as Lord Rishikesh. Legends state that Lord Rama did penance here for killing Ravana, the demon king of Lanka; and Lakshmana, his younger brother, crossed the river Ganga, at a point, where the present 'Lakshman Jhula' bridge stands today, using a jute rope bridge. The sacred river Ganga flows through Rishikesh. In fact, it is here that the river leaves the Shivalik mountains Himalayas, and flows out into the plains of northern India. Rishikesh, sometimes nicknamed "the world-capital of Yoga", has numerous yoga centres that also attract tourists. It is believed that meditation in Rishikesh brings one closer to attainment of moksha, as does a dip in the holy river that flows through it. Rishikesh is an important access point to the famous pilgrim spots of the Himalayas such as Badrinath, Kedarnath, Gangotri and Yamunotri. White water rafting in Rishikesh is becoming a popular sport, as it offers medium to rough rapids in the course of river Ganges. 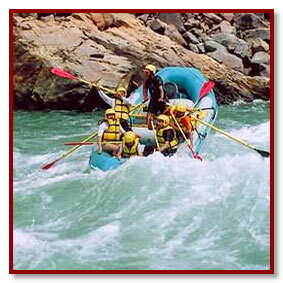 Rafting in Rishikesh is getting popular across the globe. The rafting starts from 4 major points – Bramhapuri (9km), Shivpuri (16km), Marine Drive (24km), Kaudiyala (32km) and ends at Rishikesh.